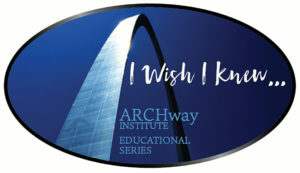 ARCHway has just launched its I Wish I Knew series, a series of 20 short video messages by caregivers and individuals dealing with an addiction disease. These folks tell others what they wish they knew at the beginning of their journey that they now know. The DVD’s are selling for $10 each which is to just help us offset our production costs or you can purchase a streaming version by going to https://vimeo.com/ondemand/iwishiknew. You can watch a sample of one of the videos. If you are interested in purchasing a DVD, please contact Jan Stuckey at jan.stuckey@thearchwayinstitute.org or 636-255-4983. She will ship the materials to you.